In 2017 the City of Los Angeles rolled out a new program aimed at reducing food waste by connecting waste haulers with nonprofits who can rescue food to feed those in need. St. Francis Center was one of the first food recovery agencies to forge partnerships with three of the city’s seven waste haulers including Athens Services to connect with their food-related clients including markets, food distributors and restaurants, recover perfectly good food that otherwise would be thrown away in landfills and use it to feed our homeless and low-income guests. 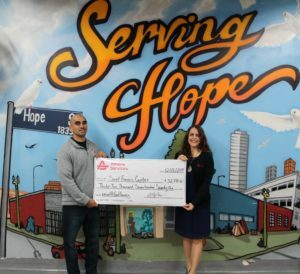 Jose Ramirez, SFC’s executive director, accepts a generous grant from Jessica Aldridge, Athens Services’ Sustainability Manager. Thanks to our partnership with Athens Services, we are rescuing more food than ever. Recently, Athens awarded us a generous grant that will help support our food rescue efforts, equipment and overhead so we can feed more of our homeless and low-income guests! Come volunteer and see firsthand how we’re utilizing this rescued food to provide hunger relief!